Do you ever feel frustrated with a relationship? Perhaps an overbearing boss, a nitpicky spouse, or a demanding child has you on the edge. Have you noticed the same types of relationship problems popping up again and again in your life? Maybe you simply want to learn how to achieve true and lasting serenity in your life and overcome negative emotions like jealousy, fear, and bitterness. 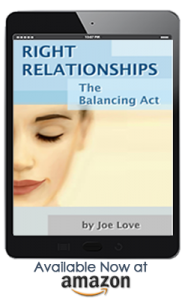 Right Relationships by Joe Love presents twelve chapters offering wisdom on how to learn from the challenges in your existing relationships. He offers insightful stories from his own work as a relationship consultant and spiritual guide. These stories tie into straightforward advice and simple exercises. Grow yourself while creating abundant love and fulfillment in your life. Each chapter in Right Relationships examines a different aspect relating to a simple theory: love is law. Spiritually driven and practically applicable, each chapter teaches you how to recognize those habits which hold your own growth back. You’ll learn how to identify the value even in seemingly negative relations and how to transform those experiences into gifts. You’ll learn the true value of soul mates and even how to build genuine contentment with your spouse. Right Relationships holds insight for us all.